Buying real estate in South L.A. is not as easy now as it used to be. The market is packed with buyers eager to get in on one of the last most affordable, most convenient, and most charming neighborhoods in the city. I’m a real estate agent in South L.A. The scarcity of inventory has created a seller’s market and left a lot of buyers wondering how they can get their offers accepted among the frenzy. In this market, buyers have to move fast and bid above the asking price to win the bidding war. I can’t remember the last time a client bid below asking price and got an acceptance. Such is life in today’s South L.A. housing market. If you live in South L.A., as I do, it’s obvious why so many people are trying to buy here. The inventory is low for a reason—not too many people want to leave, and where else could they go that is equally fabulous and affordable? This is especially true for the seniors who’ve been living in the community for many years. On the other end of the spectrum, there are many buyers coming over this way who have been priced out of the West Side, Silver Lake, and Echo Park. South L.A. is an ideal alternative for them because it’s close to Culver City, LAX, downtown, USC, and the 10, 110, 405, and 105 freeways. Many of the neighborhoods where I do business—like Windsor Hills, Baldwin Hills, View Park, and Park Hills Heights—are located on a hill, so you get magnificent views. The houses are gorgeous, spacious, and stylish—buyers are really getting a bang for their buck. And there is so much soul on our blocks. There are generations of folks who have upheld the community with tender loving care and the utmost pride. There are still block clubs and block parties—there is a distinct community here. I should know, I’ve lived in Leimert Park for many years and now Windsor Hills. 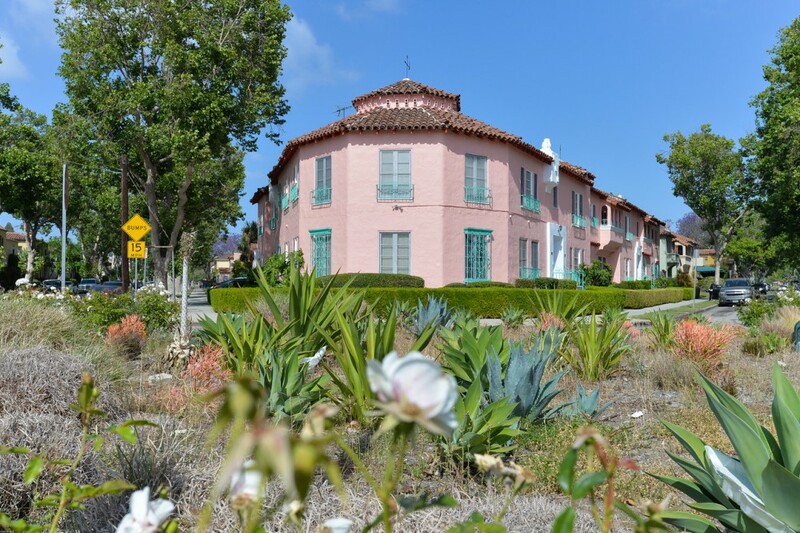 I love the ease and convenience of living here, the vitality of Leimert Park Village during a festival, and the beauty of Kenneth Hahn State Park, the prettiest place in the city, with its 360-degree view of the city I love the most. I used to think, “Why aren’t more people coming to buy these beautiful homes in the Crenshaw District and across South L.A.?” It used to feel like I was in on a big secret—not any more. Open houses are packed every weekend and there are multiple offers on everything! The high housing prices just about everywhere, and the improved safety and growth in South L.A., have brought many Angelenos to the area. The downside to the new interest is that I see many people who grew up in South L.A. and want to buy here, but can’t afford it. One of my missions is to help people like that figure things out—too many people don’t even try to pursue the idea of purchasing a home because of prices and competition. A lot of prospective homeowners are still under the impression you need a 20 percent down payment and a perfect credit score. You don’t— 3.5 percent down, a 620 score, a winning mindset, and a well-connected agent will get you there. You just have to be brave, and willing to stick it out. The high housing prices just about everywhere, and the improved safety and growth in South L.A., have brought many Angelenos to the area. It’s so nerve-wracking for these new buyers. I’ve made a habit of investing an hour (or two) to explain the market and answer questions on what to expect in the escrow process. I have a “to do” list with 12 key items covering basics from preparing an offer, what escrow is, looking out for important deadlines, how to make an offer, how to protect your earnest money deposit, and what the home inspection is going to be like. My sessions tend to have a special emphasis on how to cope with the emotional aspect of the transaction, something I can empathize with after having bought and sold my own home. I even do a few check-in calls throughout the process to see how they’re feeling about it all. A great deal of psychology is involved here. Positive encouragement is a must. Of course, in this area once you’ve got the keys, you’re getting some headaches too. The big question in South L.A. is: When are the public services going to catch up with the needs and lifestyles of community? I live here too and have small kids, and so I, like my clients, need to see South L.A. fulfill more of its potential. The need for more affordable housing is obvious, we need more parks (especially parks tucked away from major traffic), and we’re desperate for better roads and more sidewalks. There are people who live in Baldwin Hills who would like to walk down La Brea to the grocery store, without dealing with 40-mile-per-hour traffic. But there’s no sidewalk on that stretch of street. Another grave issue is that the schools have been a huge disappointment. We have some pretty good preschools, but elementary and junior high schools could be better. Crenshaw and Dorsey High Schools are OK, and View Park Prep is strong but many parents believe it should be better organized. While there are some retail and grocery options, South L.A. still has a long way to go. The produce selection at many of our major grocery chain outlets here would be totally unacceptable in Beverly Hills or Brentwood. I’d love to be able to do all my shopping and spend all my dollars in the community, but it’s tough. So I do what I can, including attending neighborhood council and stakeholders meetings. I’ve even made cash donations for special improvement projects in Leimert Park. I have also made a commitment to order books by calling Eso Won Books (in Leimert Park Village) instead of clicking Amazon, and I can usually pick them up the next day. I am a big believer that there are no new problems in the universe—all these issues have remedies! The keys to progress will be collective effort and pooled resources. I think a lot about the late Lark Galloway-Gilliam, who lived in Leimert Park—she would always say that we all need to “slow down, be present, and listen (to each other).” I would love to see neighbors old and new talk to each other more, even if it’s about ethnicity or race. It’s hard to get your neighborhood together if you don’t really know each other. Nothing can be resolved without true and honest dialogue from the community. Hopefully after conversing, folks will see that the most significant commonality is the desire to build a better community for the sake of our children. Raw dialogue can be uncomfortable but it is often where brilliant ideas and strategies for change can emerge. Heather Presha is a community advocate, wife, and mother of two. She is a current resident of the Crenshaw Community and has been a realtor for the South L.A. area for six years.